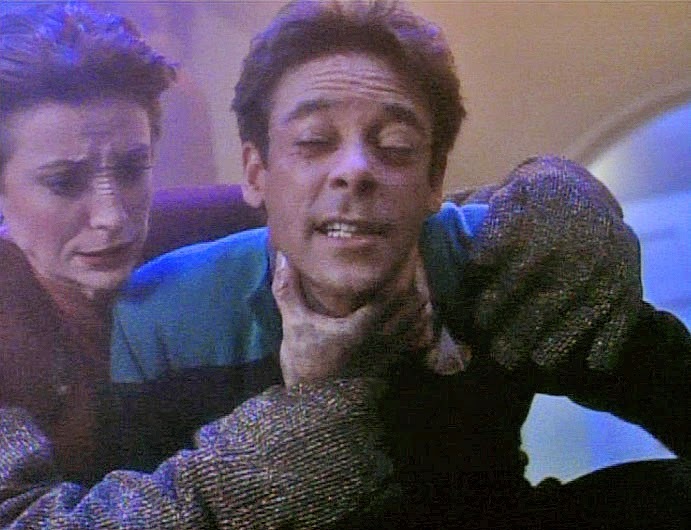 Bashir grimaces as Vantika strangles him. Bashir: Vantika's consciousness could be occupying someone else's brain while he waits for the deuridium to arrive. But whose? As a new, and hugely important waystation for commerce between Galactic quadrants, DS9 is going to have many sensitive shipments and a lot of security issues as well as interesting alien visitors. Some of these will be scarily internal. This episode's opening again involves Bashir bragging to a woman; this time it's about his miraculous life-saving hand. We never get to hear Kira's cutting retort, of course, because there's never a quiet moment for our crew, and maybe he's answered anyway: in the next few minutes, he loses one of two new patients. Or does he? It turns out our wormhole guests of the week are Kejada and Vantika. Kejada, a bounty hunter of sorts after a terrible criminal, is convinced that Vantika, despite all appearances, is alive or has found some way to survive. The two are members of a dying race which now apparently depends on some chemical to survive. The DS9 crew disbelieves her increasingly more shrill and outlandish requests for scans and tests to prove Vantika's still alive. I kept being reminded of the Nearly Dead guy from Princess Bride. Frankly, after everything they've experienced in the first six episodes, the station should be on Red Alert, but they seem dismissive. 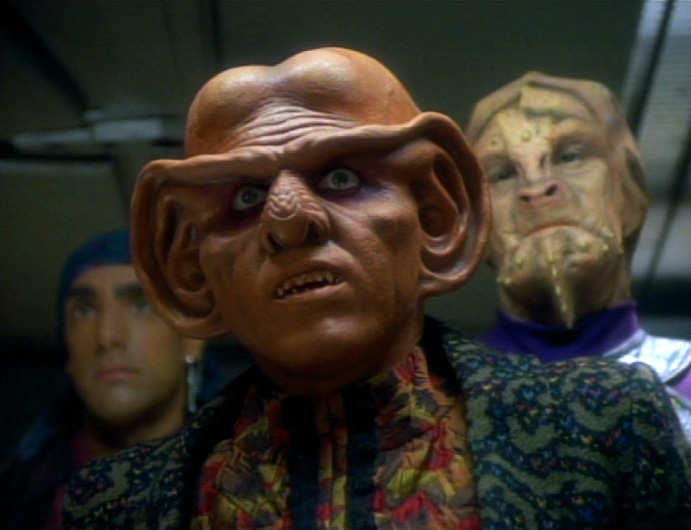 Quark looks apprehensive as he speaks to Vantika. Which is a mistake, because Vantika's engaging a little science-enabled demonic possession, and after a little bit of "Where Did Danny Hide the Cheese?" they turn him up in Bashir's body, making secret deals with Quark. I thought this episode was hokey as a pig in a pokey, especially the whole let me scratch your neck and transfer my consciousness to your brain thing. Eggh, and telegraphed really early–I knew it was Bashir immediately. When Bashir turns around and speaks in Vantika's voice, it was actually somewhat spooky for a minute. We really have an excellent crew of actors here, and the character of Bashir became a lot more interesting to me in this episode. But really, how many times have we seen one character or another taken over by inimical alien creatures? Still, many of these early DS9 episodes pay homage in one way or another to early Trek or TNG episodes; the first season of TNG also featured a possession episode, in "Lonely Among Us." The Primmin subplot is equally annoying, but it's at least acceptable power-jockeying. Still–is Primmin staying around for long? I don't recall him ever being mentioned anywhere, but he's not wearing a red shirt. The dying race thing is interesting. Is this a feasible thing? Will we all be running around trying to steal copper or iron from other races in the future in order to survive? I didn't take biology, but it sounds weird. Kira: I've never seen anything like that. Bashir: Ah yes, well, tricorders. Very accurate with live people, not so accurate with dead ones. We learn that first year medical school. Kira: Well, I was very impressed, Doctor. Bashir: And well you should have been. I impressed myself on this one actually. I can't imagine what other doctor would even consider examining the scapular nodes for parasitic infection. I just seem to have a talent, I suppose. A vision that sees past the obvious, around the mundane, right to the target. Fate has granted me a gift, Major. A gift to be a healer. Kira: I feel privileged to be in your presence. Bashir: Glad to have you along. Quark: I just heard the scream and looked up. she fell from the balcony. What was she doing up there anyway? Odo: She had an odd feeling you might be helping someone hijack this deuridium shipment. Quark: I resent the inference. Odo: It's not an inference. It's a definite suspicion. Overall - one and a half out of four "How dead is he?" tests.